Within walking distance to popular recreation and culinary destinations such as, Phelan Park, Avondale Park, Highland Park Golf Course, The Woolworth, Ocean Seafood Restaurant, Avondale Brewing Company, and more. Residents enjoy the benefit of easy access to Birmingham's largest employment center, accounting for over 65,000 jobs. Included in that number are the UAB Hospital, St. Vincent's Hospital, Region's Bank, BBVA Compass, Shipt, and Alabama Power. Minutes away from Region’s Field, UAB, St. Vincent’s Hospital, The Pizitz Food Hall, Top Golf, and the Alabama Theater. Berkadia Real Estate Advisors LLC is pleased to present the opportunity to acquire “The Core 174 Portfolio”, consisting of four strategically located, garden-style communities in Birmingham, Alabama. Originally constructed between 1963 and 1978, and renovated between 2013 - 2015, this portfolio includes Element 26, Fox Hall, 5th Ave, and Forest Park. Situated in Southside, Avondale, and Lakeview, these properties occupy the most attractive areas of town, characterized by strong employment, growing night life, entertainment scenes and proximity to a revitalized downtown Birmingham. All four properties are within 3 miles of each other, making it an easy and efficient portfolio to manage. Available free and clear of existing debt, with organic rent growth and additional renovation upside, this portfolio offers immediate scale in some of Birmingham's fastest growing, core submarkets. Element 26 is located on 14th Ave S, approximately 0.5 miles from The University of Alabama at Birmingham’s central campus, making it an ideal residence for students and employees of the university. It is also only 1.5 miles from downtown Birmingham’s Central Business District. The majority of this submarket consists of smaller properties, so the 66 units here makes this a unique and rare opportunity to acquire one of the larger communities in the area. Off street parking is very difficult to find in Southside, which makes the private resident parking at Element 26 a very attractive feature. With one way in and one way out, the property feels very private and secure as well. Due to Element 26’s strategic location and size, this property would be a great addition to anyone’s portfolio who is looking for a property that has immediate upside and the opportunity to boost rents year 1. Fox Hall is located directly next to Element 26 in the historic Five Points South neighborhood. This location shares all of the same benefits mentioned in the description of Element 26. Fox Hall is conveniently situated within 1 mile of some of Birmingham’s most prestigious restaurants and new attraction, Woolworth Recreation and Refreshment. Boasting 26,770 square feet of rentable space, Fox Hall offers residents larger units than most other communities in this submarket. Fox Hall also offers a private resident parking lot which is a feature you don’t find at many other properties in the immediate area. 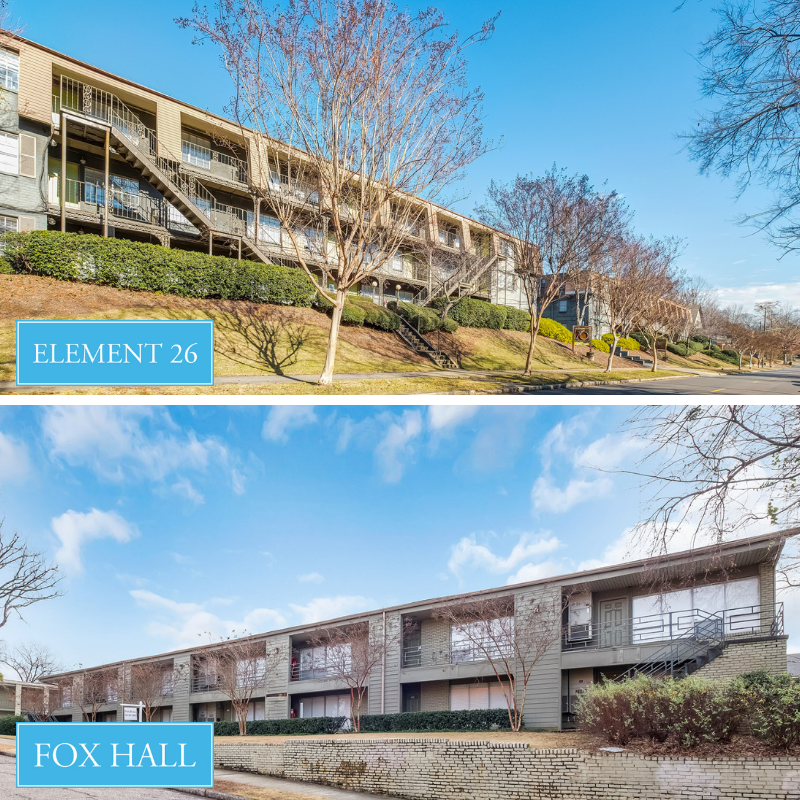 With no washer/dryer connections or ceiling fans, Fox Hall offers the next investor an easy opportunity to push rents on top of achievable organic growth. 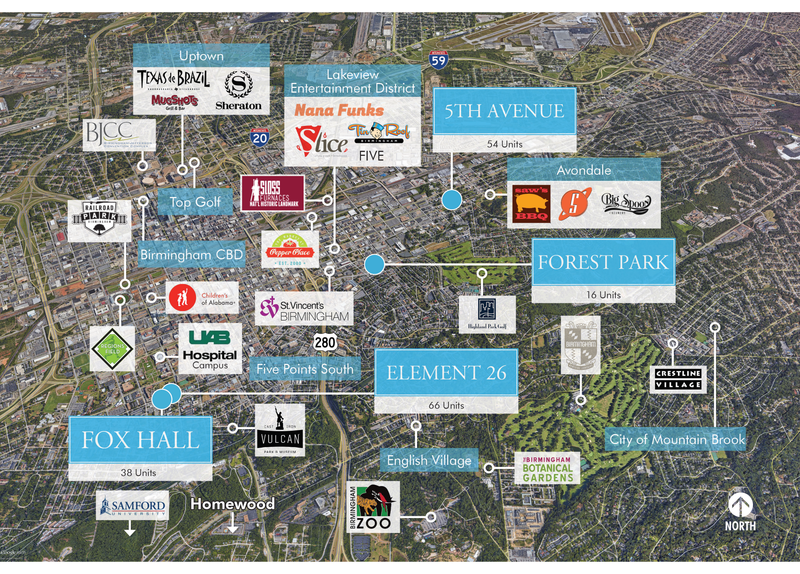 Forest Park is located directly on Clairmont Avenue within walking distance to the Lakeview Entertainment district - one of Birmingham’s premier destinations for students and young professionals. This property is also conveniently located across the street from a Walgreens, a Piggly Wiggly, and the Highland Park Golf Course. Due to it’s proximity to St. Vincent’s Medical Center, Forest Park is an ideal residence for many healthcare professionals. Residents of Forest Park also enjoy the benefit of off-street parking. Forest Park’s lack of amenities and minimal renovation provide the next owner a blank slate to easily increase rents. Fifth Avenue is a 3-story garden style community located in the Avondale neighborhood of Birmingham. It is within walking distance to local-owned restaurants, cafes and bars. Highland Park Golf Course is also less than a mile from the property. 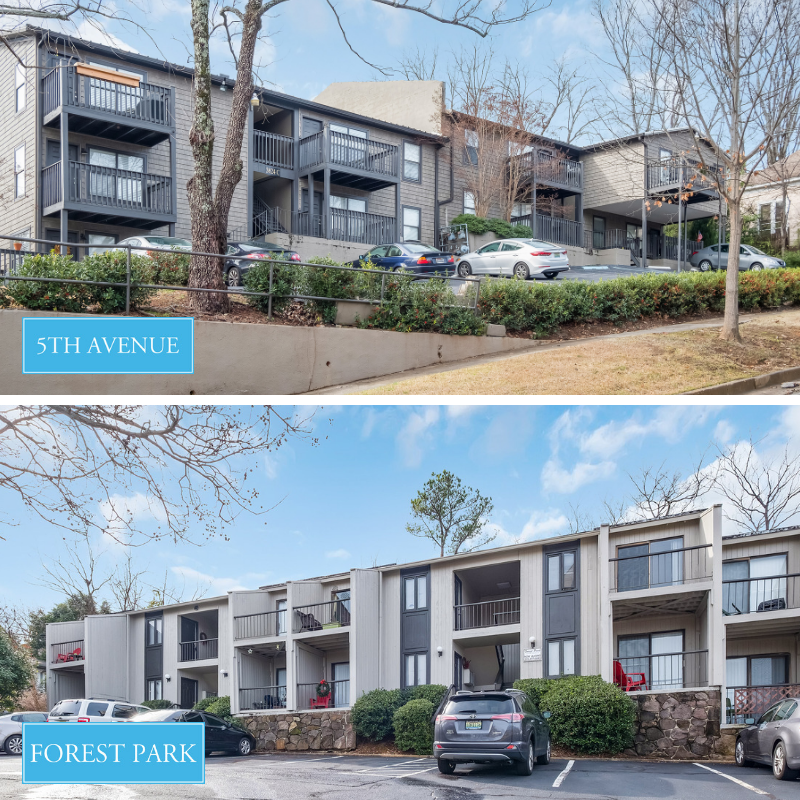 Although Fifth Avenue is the furthest property in this portfolio from downtown, it is only 2 miles from Birmingham’s Central Business District. Avondale is known as one of Birmingham’s most exciting and active neighborhoods because of the restaurants and recreation it offers. Destinations such as Avondale Brewery, Avondale Park, Melt Restaurant, and Post Office Pies are just a few of the many attractions that the neighborhood has to offer. With no washer/dryer connections, ceiling fans or other apartment essentials, Fifth Avenue is a great value-add opportunity.